RICHMOND, Va. (AP) — Tobacco company Altria Group Inc. is launching its first electronic cigarette under the MarkTen brand in Indiana starting in August and expanding its smokeless product offerings. The owner of the nation's biggest cigarette maker, Philip Morris USA, announced the details of its NuMark subsidiary's foray into the fast-growing business Tuesday. It's the last of the nation's major tobacco companies to market an electronic cigarette in an industrywide push to diversify beyond the traditional cigarette business, which has become tougher in the face of tax hikes, smoking bans, health concerns and social stigma. The Richmond, Va.-based company declined to say whether it plans to expand beyond the initial statewide test market or whether it plans to advertise on TV — a place tobacco companies have long been prohibited from marketing traditional cigarettes. During an investor presentation on Tuesday, CEO Marty Barrington said the company has "spent a good deal of time studying the category and the business opportunity." "The category is in its early stages and time will tell how it will evolve," Barrington said. Electronic cigarettes are battery-powered devices that heat a liquid nicotine solution, creating vapor that users inhale. Devotees say e-cigarettes address both the addictive and behavioral aspects of smoking. Smokers get their nicotine without the more than 4,000 chemicals found in regular cigarettes. And they get to hold something shaped like a cigarette, while puffing and exhaling something that looks like smoke. More than 45 million Americans smoke cigarettes, and about half of smokers try to quit each year, according to the Centers for Disease Control and Prevention. 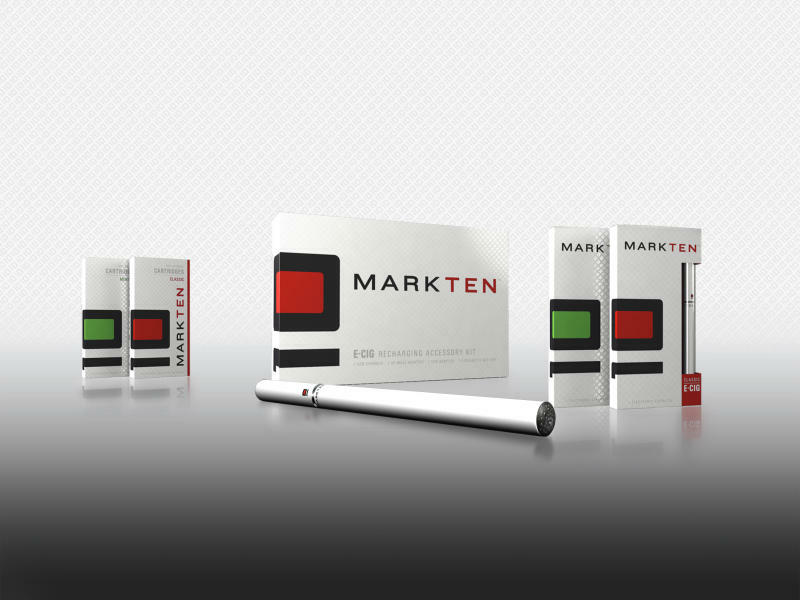 MarkTen is a disposable e-cigarette but can be reused by buying a separate battery recharging kit and additional cartridges in both tobacco and menthol flavors. The company said the e-cigarette's "Four Draw" technology is designed to give users a "more consistent experience" that closely resembles the draw of a traditional cigarette. The e-cigarette, made in China by a contract manufacturer, is expected to sell for about $9.50. Prices for additional cartridges and recharging kit were not available. The liquid for the cartridges is being produced in the U.S.
Last week, Reynolds American Inc., owner of the nation's second-biggest tobacco company, announced that it is launching a revamped version of its Vuse brand electronic cigarette in Colorado in July, with its sights set on expanding nationally. Lorillard Inc., the nation's third-biggest tobacco company, acquired e-cigarette maker Blu Ecigs in April 2012 and has expanded to more than 80,000 retail outlets. The market for e-cigarettes, which includes more than 250 brands, has grown from the thousands of users in 2006 to several million worldwide. Analysts estimate sales could double this year to $1 billion. Some go as far as saying consumption of e-cigs could surpass consumption of traditional cigarettes in the next decade. Tobacco company executives even noted that e-cigarettes drove total industry cigarette volumes down about 600 million cigarettes, or about 1 percent, during the first quarter, excluding Internet sales — a major avenue for e-cig purchases. The Food and Drug Administration plans to assert regulatory authority over e-cigarettes in the near future. Public health officials say the safety of e-cigarettes and their effectiveness in helping people quit regular smokes haven't been fully studied. Despite the regulatory uncertainties, electronic cigarettes have attracted the attention of investors. Electronic cigarette maker Njoy Inc. said Monday it has raised $75 million in financing from investors including Napster founder and entrepreneur Sean Parker and Homewood Capital principal Douglas Teitelbaum to be used for marketing, clinical trials, research and development, and international expansion. Musician Bruno Mars also has invested the company whose Njoy King disposable e-cigarettes are available in more than 60,000 retail stores. Like other tobacco companies, Altria also is focusing on cigarette alternatives for future sales growth because the decline in cigarette smoking is expected to continue. The company said Tuesday it is expanding its Verve chewable, disposable nicotine discs from 60 stores to about 1,200 throughout Virginia in the second half of the year. It also plans to debut a gum containing tobacco in Denmark this summer called Tju (pronounced like "chew") through a previously announced joint venture with an affiliate of Fertin Pharma A/S to develop smokeless nicotine products. Altria, whose brands include top-selling Marlboro cigarettes, Skoal smokeless tobacco and Black & Mild cigars, also on Tuesday reaffirmed its 2013 full-year adjusted earnings forecast of between $2.35 and $2.41 per share. The company also owns a wine business, holds a voting stake in brewer SABMiller, and has a financial services division.